Diwali in New York is back with a bang this year! New York Indians are gearing up to celebrate the festival of lights through a number of Diwali events from Times Square to Garden City. Diwali is one of the few Indian festivals which are celebrated with great pomp and loads of enthusiasm. We at Indian Eagle Travel compiled some of the best New York Diwali 2018 events along with venue and timing details below. With most of the school districts in New York and New Jersey having declared Diwali a holiday, the Festival of Lights is a bigger celebration for Indians in Northeast USA this year. Times Square is one of the best places to celebrate Diwali in New York. Diwali at Times Square is not just the biggest of all October 2018 Indian events in New York but also the grandest celebration of Indian culture. The New York Indian community has been waiting for the Times Square Diwali 2018 with a bated breath. It is an 8-hour celebration over live performances, fashion shows, dance & music competitions, photography exhibition and other creative programs like rangoli painting. The skyline of New York City dazzles with fireworks during Times Square Diwali 2018. One of the best Diwali events in New York, South Street Seaport Diwali 2018 seems to promise a good time for New York Indians. The Association of Indians in America (AIA), an organization of Asian immigrants in the US, hosts Diwali for New York Indians as part of their socio-cultural activity every year. The AIA works for the welfare of Asian Indians and promotes the culture of India in USA. Around 125 children participated in the celebration last year. South Street Seaport Diwali 2018 is one of the free Indian events in New York. Among the few places for free Indian events in New York this Diwali 2018 is the Museum of the City of New York. Open to all, the museum invites New Yorkers, irrespective of religion and community, to celebrate the Festival of Lights. Visitors can make and decorate their own diyas for home. Diwali 2018 at the Museum of the City of New York will culminate in a traditional Indian feast. A special cultural program is on the agenda, too. The Divya Jyoti Association of New York hosts a grand celebration of Diwali at Richmond Hill in New York City every year. One of the most popular New York Diwali events, the Motorcade & Cultural Show comprises creative entertainment programs including a parade, a havan ceremony, worship of Goddess Lakshmi and prize distribution. The event culminates in awarding lucrative prizes to the best decorated vehicles. The Diwali Motorcade event is all the rage with young Indians in New York City. If you’re wondering where to celebrate Diwali 2018 with kids in New York, then Asia Society is one of the few best places for Diwali events in New York City. Named ‘Family Day: Diwali Lights Up’, the Asia Society 2018 program is full of wonders for Indian kids in New York. Diwali at Asia Society on 725 Park Avenue in New York is a happening celebration for your kids to learn the tidbits of Diwali festival. Supported by the New York State Council on the Arts and the Governor Andrew Cuomo, Flushing Town Hall, a non-profit organization, is all set to celebrate Diwali 2018 in New York on November 10. The 4th Annual Diwali Festival at Flushing Town Hall in Queens is speculated to be a grand celebration accompanied by cultural programs including Bhangra and Kathak. This New York Diwali 2018 event will feature Abha Roy, an eminent Kathak artist and DJ Rekha, the founder of Basement Bhangra. Since Flushing Town Hall Diwali Diwali in Queens is a family event, the programs also include cooking workshops, henna painting, dance lessons, rangoli workshop, jewelry making workshop and likes. Moreover, Indian handicrafts will be there for sale. Interestingly, teenagers in the 13 to 19 age group will be let in to attend any performance or program for free. Do join the Hindu chaplains at NYU if you are looking to celebrate Diwali 2018 in New York traditionally. Hosted by the Hindu Student Council and the Global Spiritual Life at NYU, the Diwali celebration will begin with aarti as well as bhajans and culminate in distribution of Prasad. Admission to the event is free for all. Diwali on the Hudson turns 5 this year. One of the popular Diwali 2018 events NYC, it is recommended for the lovers of Indian food in New York City. A widely published event, Diwali on the Hudson 2018 sells fast every year. Indian street food by Desi Galli at Lexington Avenue is a major attraction of Diwali on the Hudson for the year 5. The Afghan Hindu Association is one of the cultural organizations in New York. It organizes a fair to celebrate Diwali at AsaMai Hindu Temple & Community Center in Hicksville every year. 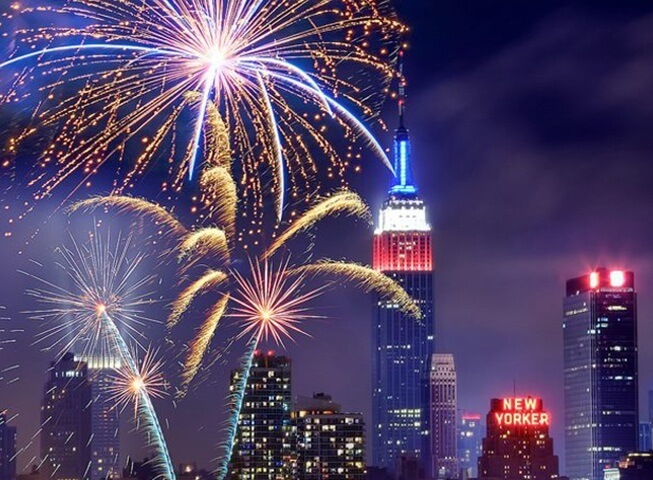 New York Diwali 2018 is their 14th annual celebration. The fair is one of the most spectacular Diwali 218 events in New York. Pelham Art Center is one of the best places for Diwali celebration in New York. Part of the Folk Arts Series at Pehlam Art Center, Diwali is a most colorful, cultural celebration here. Indian Classical dance performance is a major draw of Pelham Art Center’s Diwali 2018 in New York. Dancer and choreographer, Sadhana Paranji will mesmerize the audience with her Kuchipudi Margam dance. The performance, which is a free event, will be followed by two free hands-on art workshops. Travel Beats is an Indian American Community Portal by Indian Eagle, a leading travel booking partner of Indians in USA. Subscribe to Travel Beats’ free newsletter for the latest Indian community news, upcoming Indian events in US cities, air travel updates and discount airfares for cheap flights to India from US cities. Namaste / good afternoon – the Diwali motorcade will be on 10/22 starting at 3 pm. Hi Sunil! Thank you very much for letting us know the date! We have updated the post. Pl advise me re any Diwali events in NYC I write for the Indian press. Please send in your query to share@blogbox.indianeagle.com. Thank you!